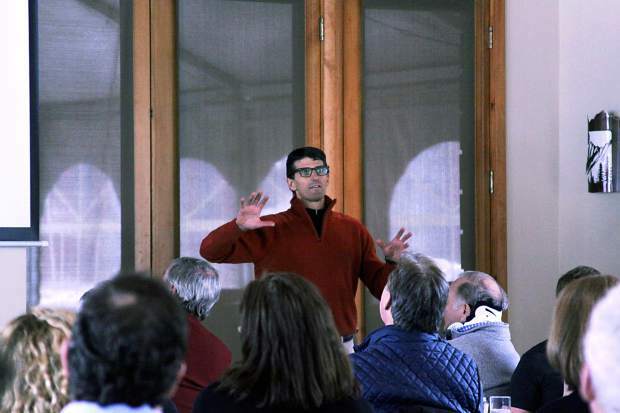 Aspen Skiing Co. CEO Mike Kaplan makes a point Wednesday during a presentation to about 80 people attending the Aspen Business Luncheon. Officials with the International Ski Federation (FIS) are urging Aspen to upgrade the base of Lift 1A but they aren’t threatening to pull the 2017 World Cup Finals out of Aspen if the improvements aren’t made, according to Skico Chief Operating Officer David Perry. FIS officials decide the venues for men’s and women’s World Cup ski races. Aspen bid on and was awarded the World Cup Finals for March 2017. It was awarded based on current infrastructure, although FIS officials have urged Skico to make improvements over the last two years, Perry said. Skico upgraded the grandstand and the race arena at the base of Lift 1A, also known as the Shadow Mountain Lift, for the women’s World Cup races in November. The race headquarters at the St. Regis is also “very nice,” he said. The problem is the racers and race officials must walk through a “Third World Country” to get from the St. Regis to Lift 1A, according to Perry. “The lift works fine and the capacity of the lift works fine, but they want to see improvements,” Perry said. It doesn’t make sense for Skico to replace the chairlift without knowing how the base area will be developed, Perry said. Skico owns only a “sliver” of land in that area, so it depends on other property owners to advance plans. If upgrades to the Lift 1A base aren’t made, it might eventually affect Aspen’s ability to host World Cup events, Perry acknowledged. Aspen Skiing Co. is ready to launch a study on a project that could boost the skiable terrain on Aspen Mountain by about 20 percent, Chief Operating Officer David Perry said Wednesday. Skico is “about to settle” land ownership questions that have delayed the Deep Pandora project, Perry said. The project would add intermediate and expert terrain on the skier’s right of Walsh’s run on the backside of Aspen Mountain, he said. Aspen Mountain currently has 675 acres, so a 20 percent gain would add about 135 acres. The Pandora’s area is already heavily skied on powder days by skiers and snowboarders who access it via a gate south of the upper terminal of the Silver Queen Gondola. The terrain is within the ski area permit boundary but it isn’t part of the managed ski area. It isn’t regularly swept by ski patrol. It includes an area known as Postcard that is below and to the right of Walsh’s and is low-angle, gladed rolling terrain that would be a great addition for the “average Aspen Mountain guest,” said Rich Burkley, Skico vice president of mountain operations, in a previous interview. A Pandora’s chairlift would also allow Skico to extend the existing expert trails of Walsh’s, Kristi and Hyrup’s. Perry and Skico President and Chief Executive Officer Mike Kaplan provided an update of the project during a wide-ranging presentation covering numerous topics Wednesday at the Aspen Business Luncheon. An audience of about 80 people cheered the prospects of new terrain. “We’re going to now enter a period of time over the next couple of years where we’re going to study that,” Perry said. It will require an amendment to the existing Aspen Mountain Ski Area Master Plan, he said, and some level of review by the U.S. Forest Service under the National Environmental Policy Act. “Hopefully we’ll be able to open a new lift and put some new terrain on the backside of Aspen Mountain in the next couple of years,” Perry said. When pressed by an audience member for more details, Perry said Skico officials need to study how the addition of a Pandora’s chairlift would affect skier patterns and use of the Gent’s Ridge chairlift, a slow, four-person lift nicknamed “The Couch.” The Pandora’s lift would serve most but not all of the terrain served by The Couch, he noted. Skico has looked at moving The Couch or realigning the lift and the Bell Mountain lift to get all terrain covered. “We don’t have a final solution in that area, so what we decided to do when we go ahead is to install the Pandora’s chair and see how the traffic flows are affected, see how people’s ski patterns change or don’t change and then (make a decision),” he said. The issue isn’t as simple as replacing The Couch with a high-speed quad at its current alignment, Perry said. “We could if we had $8 million lying around,” he said.